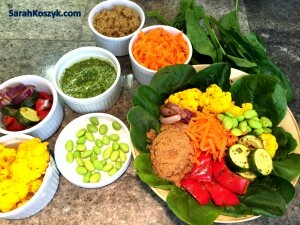 Celebrating our health and wellness, I made a delicious Edamame, Amaranth, and Chimichurri Nourish Bowl. 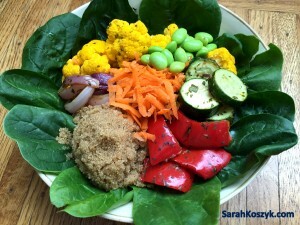 You will definitely enjoy the Edamame, Amaranth, and Chimichurri Nourish Bowl. 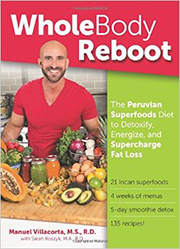 It’s a bundle of love and nutrition in one. To your vitality, taste buds, and happiness! 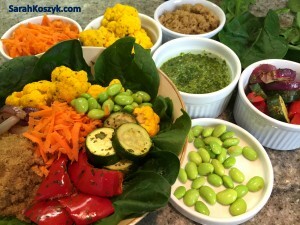 Celebrating our health and wellness, I made a delicious Edamame, Amaranth, and Chimichurri Nourish Bowl. 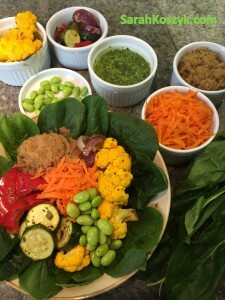 A Nourish Bowl is a perfectly well-balanced and complete meal in one dish. 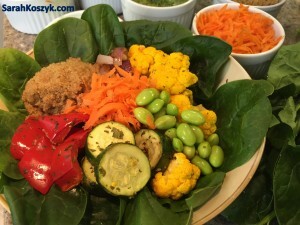 To be defined as a “Nourish Bowl,” the huge salad must contain the following: • raw vegetables (spinach, carrots) • dark-leafy greens (spinach) • fiber-filled whole grain (amaranth), • heart-healthy fat (olive oil) • plant-based protein (edamame, amaranth) • lots of colorful vegetables (zucchini, cauliflower, red onion, red pepper, spinach, and carrots) You will definitely enjoy the Edamame, Amaranth, and Chimichurri Nourish Bowl. It’s a bundle of love and nutrition in one. To your vitality, taste buds, and happiness! Preheat the oven to 400° Bake. In a medium sized pot, bring the water and bouillon to a boil. 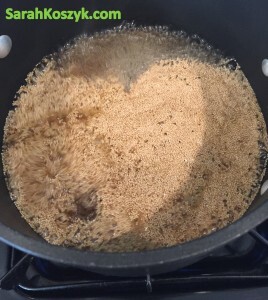 Add the amaranth and cook for 20 minutes until the water is absorbed. 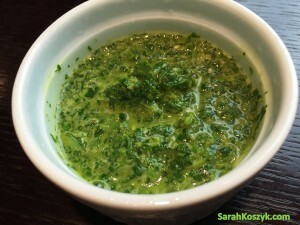 While the amaranth is cooking, puree the cilantro, lemon juice, garlic, olive oil, and salt in a food processor to make the chimichurri dressing. The dressing will be thick. Slice the zucchini in rounds. Cut the red onion in slivers. De-seed the red pepper and slice into 12 big chunks. Chop the cauliflower into mini-sized trees. 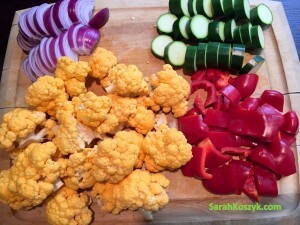 In a medium bowl, toss half of the cilantro puree with the zucchini, red onion, red pepper, and cauliflower. 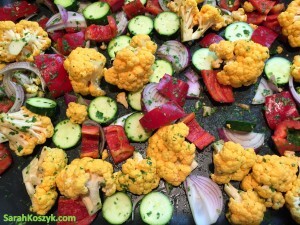 Spray a roasting pan with cooking spray and add the tossed vegetables to the pan. Roast the vegetables for 20 minutes. Chop the spinach. Grate the carrot. 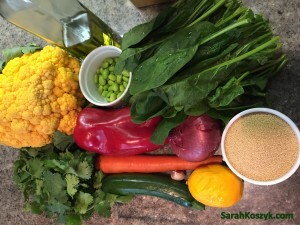 When the amaranth and roasted vegetables are done cooking, remove them from the stove top and oven. 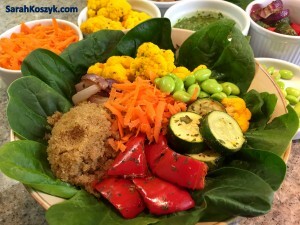 In a large bowl, mix together the cooked amaranth, roasted vegetables, edamame, spinach, and carrot with the remaining chimichurri dressing. Serve.